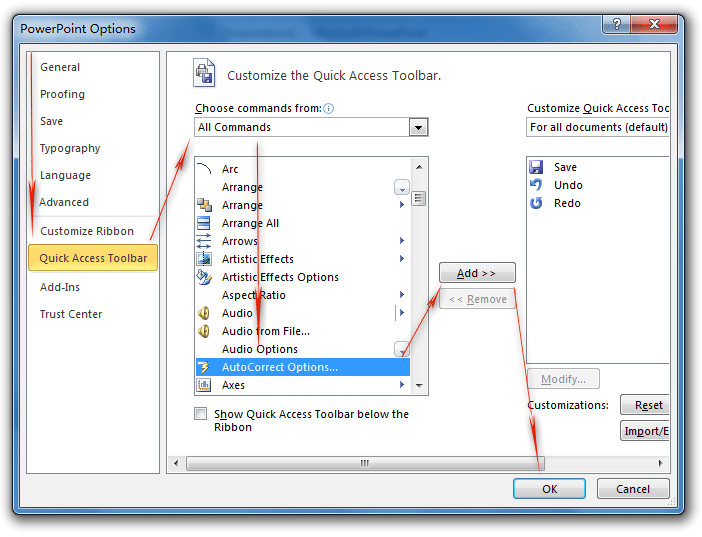 How to Bring Back Classic Menus and Toolbars to Office 2007, 2010, 2013, 2016, 2019 and 365? Kutools for Excel: 120 Powerful New Features for Excel. Office Tab: Tabbed Editing and Browsing in Office, Just Like Chrome, Firefox, IE 8/9/10. At the bottom of drop down list, you will view the AutoCorrect Options button. Click this item, and you will get into AutoCorrect dialog box. Please click to know more information and free download Classic Menu for Office 2010 / 2007 suites and programs. Go the AutoCorrect Options section, and you will view an AutoCorrect Options button. Click OK button at the bottom. Then you will get into AutoCorrect dialog box by this button. 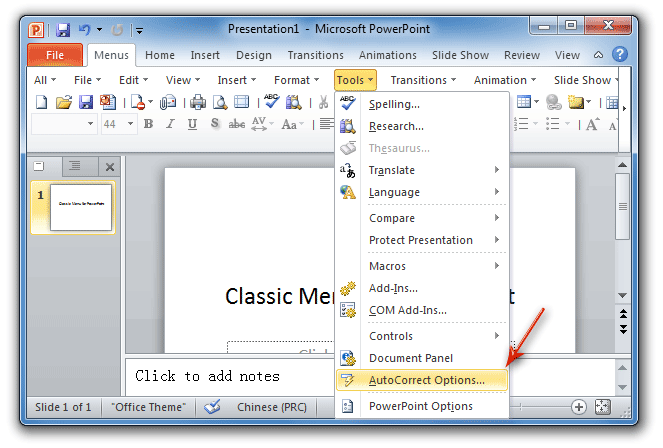 Go back to PowerPoint 2007 or 2010 user interface, you will the AutoCorrect button has been added in the Quick Access Toolbar at the top of Ribbon. Brings your familiar classic menus and toolbars back to Microsoft PowerPoint 2007, 2010, 2013, 2016, 2019 and 365. You can use PowerPoint 2007/2010/2013/2016 immediately and efficiently, and don't need any trainings or tutorials when upgrading to Microsoft PowerPoint 2007, 2010, 2013, 2016, 2019 and 365. It includes Classic Menu for Word, Excel, PowerPoint, OneNote, Outlook, Publisher, Access, InfoPath, Visio and Project 2010, 2013, 2016, 2019 and 365. It includes Classic Menu for Word, Excel, PowerPoint, Access and Outlook 2007.